Why Are We In The Mess We Are In Today? I believe that every one would agree that this world has gone absolutely crazy over the past decade or two. This country is very divided right now. We are divided politically, racially, and economically like never before in the history of the country. In addition to being divided we find society suffering from gender confusion and loss of purpose. All of these conditions are really only consequences of a much deeper condition of society. We have been discussing how we can build “healthy trees.” Of course, this is merely an analogy to raising our children and youth to be strong, vibrant Christians. I believe Christian parents, church leaders and educators want future generations to be “healthy trees” as described in the Psalms. the soil in which our children will be planted. The soil represents the prevailing worldview of society and its educational system. the roots that our children will develop by absorbing the nutrients from the soil. If they are planted in a secular educational system, they will develop beliefs that will be shaped by lies that dominate a secular worldview. the trunk of our children’s lives are the values that they will hold on to based on their beliefs. Whatever believes our children develop will be communicated up to the branches of their lives. These values are communicated to the rest of the tree through education, media, and other aspects of a secular culture that is captive to lies. To complete the analogy of growing “healthy trees” I want to talk about a trees branches and the fruit a tree will produce. The branches of a tree represent the behavior exhibited in a person’s life or in society as a whole. The fruit that is produced nothing more than the consequences that will result from the behaviors being practiced. When we talk about the political hatred that is prevalent in all levels of government or the racial animosity that exists all across the country or any of a myriad of other conditions that are dominating our culture today, we are actually describing the consequences that are a result of a pattern of bad behavior of the people. The problem is that if we only focus on the terrible consequences we are all experiencing today, we end up cursing the darkness. However, we are not doing anything that will get to the root of the problem. This means society will keep spiraling down into greater moral decadence. If we are going to raise our children to stay true to the faith and be able to not only survive but also thrive in today’s postmodern, anti-Christian culture we must address the real issue that has resulted in the horrific consequences we are reeling under. 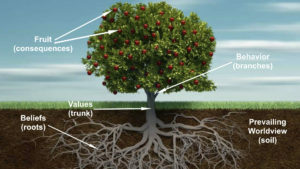 In putting all the elements of how a tree grows together that result in these cultural consequences we get a clear picture of where the real problem lies (see Figure 1). 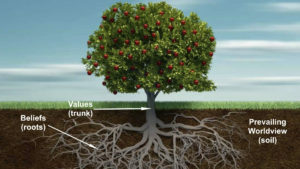 Unfortunately, we try to solve this dilemma by trying to prune the bad behavior (branches) out of the tree or reshape our children’s values by implementing “new” programs in the church and home. This has been the pattern of trying to stop this slide into moral decay for the past several decades. Even with all of these worthy efforts, nothing has changed and, in fact, it continues to get worse. If there is any chance of seeing our children and youth know truth and think and act from a biblical worldview, we must address the elephant in the room. That elephant is the soil in which we have planted the vast majority of our children and youth. It is imperative that the home and church must address the issue of education biblically. If the body of Christ would do this one thing, Christians would first have to understand the difference between the soil found it a biblical education and that which is associated with secular education. The bottom line is this. The consequences we are facing in this country and others are facing around the world are not the result of merely bad behavior. It is also not the result of simply forming faulty values that are driving this bad behavior. We must understand that for the past 50+ years generation after generation have been planted in bad soil. In turn they have developed a secular worldview (root system of beliefs) by absorbing the many lies that are the basis of a secular worldview. It is time for all Christians to plant their children and youth in good soil. To help the home, church and school accomplish this, I have been working on developing a variety of resources that will help parents, church leaders and educators know and understand the basics of a biblical worldview and a biblical philosophy of education. I am now able to offer these resources (and more that will be developed in the future) to Christian schools and churches when they become a Prime Member of Kingdom Education Ministries. For a low annual subscription rate a Christian school and/or church can provide all of their paid staff and board members full access to these resources. Also, any schools or churches that become an annual KEM Prime Member between now and April 30th, will receive a discount coupon that will allow their families/members to be come Prime Members at the low rate of only $15 for a full year. For more information about becoming a KEM Prime Member you can click here or email me at glen@kingdomeducation.org. I believe we must act now before it is too late! Before we came to the current state of left wing social insanity (if someone claims to be Napoleon we say he is mentally ill, if a man claims he is a woman, society believes and affirms him!) we went through a interim step of holding conservative Judeo/Christian values without the necessity of believing in the God of the Bible. Those values died an agonizing death when they faced the simple question “Why?” Why should we hold these specific values? Don’t other societies and other great thinkers hold other, quite different values. What makes our values any better than anyone else’s? The only justifiable answer of course was the one that was politically in correct to give – that the God of Scripture is the only real God and that truth, life and salvation can only be found in His Son. “Why is physical courage so common and moral courage so rare?” Said Mark Twain. Why indeed.